Like its cousin the tomato, eggplant is actually a fruit, not a vegetable. What is the link to eggs? Unlike today’s purple pear-shaped types, early eggplants were white and egg shaped. Specialty markets often carry white; purple-and-white-striped; thin Japanese; and small Italian eggplant varieties. Eggplant is available year-round with the peak harvest from late summer to mid-autumn. While popular in Mediterranean dishes from Greece, Italy and southern France, eggplant is also a staple in Indian, Moroccan and Middle Eastern cuisines since it’s native to Asia and Africa. Meaty in texture, eggplant is often used in sandwiches and casseroles in place of meat. It’s also delicious in stews, pasta sauces and dips. Eggplants bruise easily. Avoid any with soft spots or shriveled blemished skins. Select small to medium eggplants rather than large ones. They usually contain fewer seeds and have a sweeter, less bitter, flavor. Refrigerate unwashed eggplants in a plastic bag for up to 5 days. Since they become more bitter with age, use as soon as possible after purchasing for the best flavor. Rinse eggplants under cold water just before using. Trim off and discard the stem ends and caps. 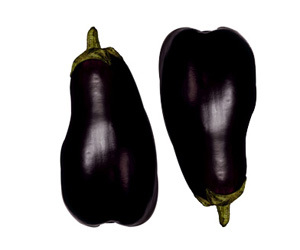 The skins of small young eggplants are edible and do not need peeling. The tough skins of older eggplants and white eggplants should be peeled with a vegetable peeler or paring knife. Peel just before using as the flesh discolors quickly. Cut eggplant into crosswise or lengthwise slices with a chef’s knife. The slices can then be cut into cubes, if desired. Eggplant is often salted and drained before cooking to remove bitterness and release moisture so less oil is absorbed during cooking. Small young eggplants usually do not require salting. To salt eggplant, cut as directed. Place in a colander and sprinkle evenly with salt. Let stand 30 minutes to drain. Rinse and pat dry with paper towels. Roasting, sautéing, baking, frying, steaming, microwaving and broiling are all acceptable cooking methods. Since eggplant absorbs oil like a sponge during cooking, slices are often dipped in a flour, egg and bread crumb coating before frying. Brush eggplant slices with oil or vinaigrette and grill with other vegetables for a delicious side dish. Tuck cooked eggplant slices into your favorite sandwich filling. Add peeled chopped eggplant to the vegetables in your favorite chili recipe. Prepare delicious classic eggplant dishes, such as eggplant Parmesan, ratatouille, caponata and moussaka. Toss chopped eggplant into your favorite stir-fry as it blends well with the flavors of garlic and sesame oil. Stir roasted eggplant chunks into marinara sauce before tossing with pasta.